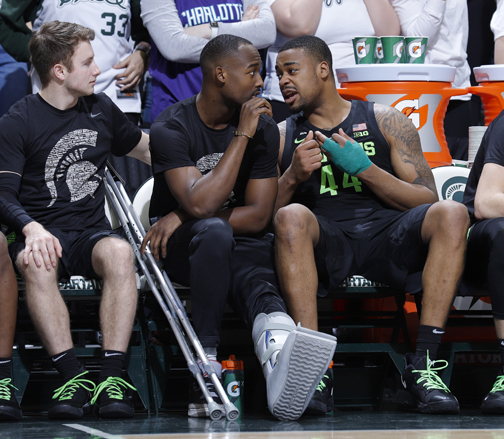 EAST LANSING — Michigan State forward Nick Ward had surgery on his broken left hand and is expected to be out of for at least a few weeks. “I’m a quick healer so I’ll be back,” Ward said Monday with his left arm in a sling. Ward said he was injured when his hand made contact with an opponent’s elbow in a 62-44 win over Ohio State on Sunday. Ward is the team’s second-leading scorer at 15.1 points a game and third-leading rebounder at 6.7 per game. The 6-foot-9 junior returned to school after putting his name in the NBA draft last year. , the team’s third-leading scorer, had season-ending surgery on his left foot this month. The 10th-ranked Spartans (21-5, 12-3 Big Ten) host Rutgers on Wednesday and play at No. 7 Michigan on Sunday, starting the week sharing first place in the Big Ten with the Wolverines. “Our expectation for victory hasn’t changed one iota,” Izzo said. Sophomore Xavier Tillman, who averages 7.3 points and 8.9 rebounds, will likely start in Ward’s place in the post. Freshmen forwards Thomas Kithier and Marcus Bingham, both of whom score a little more than one point per game, will also have chances to play larger roles without Ward in the lineup.